I ran into Chris Painter a few months back at a local SF East Bay New Tech Meetup event. I know Chris from his Sony days. 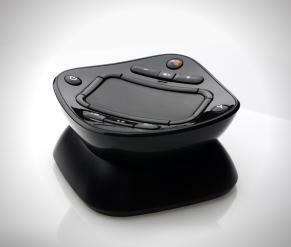 I found out at the time that Chris now has started a new venture, Glide.TV and their first product looks really cool. It’s called the “Navigator” and it’s a combination of really innovative touch-based input device and custom-browser and software keyboard. Unfortunately I don’t have the actual device myself yet, because they have temporarily sold out. But I got some time to speak with Chris who provided a lot of info. When I get some time with my hands on a real Navigator myself, I’ll post a follow-up review. Basically, the Navigator starts off as a plug-and-play (no drivers needed) mouse. Then, Glide.TV provides software for a soft (on-screen) keyboard and a customized browser specifically designed for the living room experience. The software works on Mac and PC (and even Linux, I’m told). Chris gave me a demo and let me try using the navigator myself. I was able to use it effectively right away. At home, I have a Mac Mini permanently installed as part of my living room TV entertainment setup. I still have “old school” TV but increasingly, we’re watching Youtube, Netflix, Hulu, and other online content from the couch – and a traditional mouse and keyboard are just not the best living room input devices. The Glide.TV Navigator lets you operate PC or Mac-based TV with one hand, the way we’re used to, without a bulky keyboard in our lap or having to hunch over the coffee table to use the mouse. Overall, it looks really impressive and I can’t wait to get one for my home setup.